Can you feel it? The holiday cheer (and hustle) that’s enveloping every store, commercial, and the various “counting down to Christmas” movies? I mean, wasn’t April like yesterday? And what happened to Thanksgiving? Did we skip over it this year and go straight to Christmas? I’m not mad about it one bit. If it were up to me, our tree and decorations would already be up but, when I suggested this, my husband looked at me like I had 3 heads. Ok, I’ll try again December 1st… Or the day after Thanksgiving. As you can probably tell, this is my favorite time of year. And, let’s be honest, it’s mostly because of all the amazing food, cheesy holiday movies, family time, and holiday scented candles. But, with so many family and friend get togethers, traveling, and heavy meals, it’s easy to feel stressed and like your soul is exhausted. 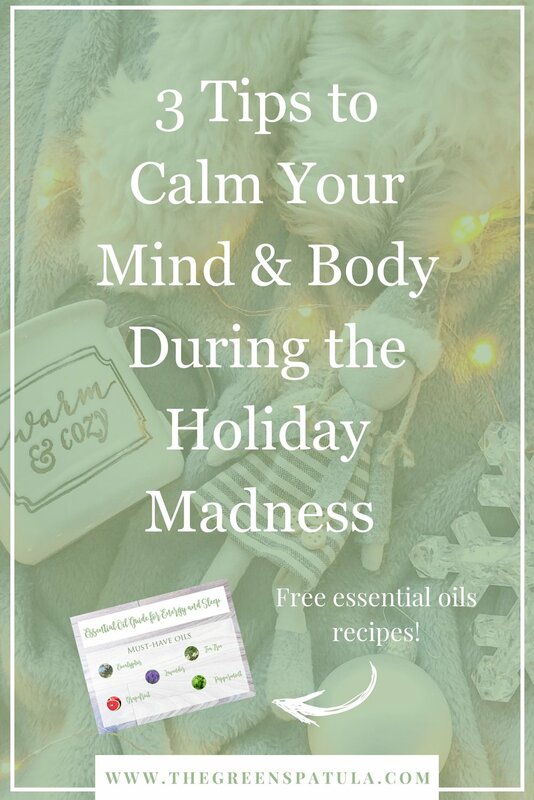 So, to help you maintain your sanity and reduce stress, I have listed my top 3 self-care tips so you can easily calm your mind and body during the holiday madness. I have also listed my favorite essential oils that will help you keep your cool throughout gift shopping, traveling, and the inevitable interrogations from your nosy family members. Remember to download my to-go essential oil diffuser blends at the end of the post! They’re so relaxing and easily turn my mood around. Add essential oils, like lavender + lemon, and 1-2 cups of epsom salts to detoxify your system and soothe your soul. Grab a book, a glass of wine, and light some candles to fully enter relaxation mode! If your traveling or don’t have a bath, just use your shower! Drop a few drops of eucalyptus oil on a wet washcloth and place that around your shower head. The steam will help carry the scent around your bathroom, which will clear your head and uplift your mood. You don’t have to be an avid yogi or expert at meditation to experience the benefits. You don’t even need a membership to a studio! YouTube has amazing instructors that have free videos ranging in lengths and difficulty levels. All you need is your laptop/phone and a mat or a towel to practice on. Pick a quite and comfortable room in your home that is away from any distractions (like people talking or a the sounds from the TV). You can use oils such as lavender and frankincense (a few drops on your mat or on your wrists) for deeper relaxation. Then, select a video and it’s time to flow! If you want to try meditation, all you need is yourself and your breath. If your new to meditation or want more guidance, I highly recommend downloading a meditation app. I’ve been using Calm for years and it’s my favorite app on my phone. Find a quiet spot in your home and rest in a comfortable position. Sit relaxed in a cross-legged position with a straight back or rest on your back. It doesn't matter how you sit as long as you are comfortable and your breathing isn't impaired (avoid laying on your stomach). Close your eyes and breath in and out normally while focusing on your breath as it enters and leaves your body. A common meditation misconception is that you must clear your mind. That’s not the focus here; you’re simply witnessing the breath. If your thoughts pull your attention away, just remind yourself to return to the breath. Repeat for as long as you wish to sit (5-10 min is a good place to start). You can also use a "mantra" or phrase to help your focus. When my mind is too distracted it helps to think that I am “breathing in” and “breathing out.” This anchor focus my attention. Dab some of lavender or frankincense on your wrists and chest to help you relax further. Getting out into nature is an instant mood booster, especially if you’ve been traveling or indoors all day. I love taking Kyra, our dog, out for a walk around our neighborhood. It helps clear my head, stretches our legs, and I can catch up on podcasts or listen to an audiobook. I actually think of my best ideas for blog posts and solutions to life issues when I go for walks (also in the shower funny enough). If I’m extra stressed, I’ll dab a bit of peppermint essential oil on my temples, wrists, and behind my ears before heading out. The tingly minty scent helps clear my head and gives me so much energy to continue my day. If you are feeling overwhelmed and a bit down, you can also use grapefruit to boost your positivity. When I hear the word “essential oil,” I instantly think of lavender. It’s a staple to any essential oil collection and the perfect oil to use as a beginner. Lavender has a fresh and floral scent as well as powerful calming properties, which is why the oil is so popular and well loved. It’s the go-to oil in my house for anything from relieving stress to healing burns. Uses: Add a couple drop onto your pillowcase before bed for a relaxing night’s sleep, on your yoga mat to infuse your practice with a calming scent, or even in your bath (remember the epsom salts!). If you’re visiting family and you’re a nervous flyer like I am, put some lavender on your wrists and on your head behind ear. It will help you stay mellow! Frankincense is known for its spiritual and grounding characteristics that can enhance meditation and pray. But, it can also help your complexion. I started using it a few months ago it has really helped my acne and scars. After using it, I can tell my skin is less red and it’s been softening my old acne scars. Uses: Mix 1 drop with a carrier oil for acne or as a spot treatment on troublesome areas on your face. Place a few drops on your wrists when meditating as the oil has spiritual and grounding qualities. Like lavender, peppermint is a staple in my house. My mom would always give us peppermint in some water if we had tummy troubles or put some on our temples for headaches. It has a fresh and tingly sensation and it is a lifesaver! The herb has been used for centuries for its medicinal properties. They have even found traces of peppermint in Egyptian pyramids, Greek mythology, and ancient Chinese medicine! It’s a natural remedy for tension and digestion problems with no side effects. Uses: Drop one drop in warm water as an invigorating and digestive tea. Alleviate headaches, stress, a groggy mind, and tension by placing the oil on your temples and on the back of your neck. If the oil on its own is too strong, mix with some coconut oil (about a dime sized amount) to dilute the peppermint. Mix the two in your hands and rub it onto the back of your neck and shoulders. Eucalyptus is associated with the lungs and purifies stale and congested air. It’s great to help with any respiratory problems, like asthma, bronchitis, and even pneumonia! It has antimicrobial properties so it’s a great natural germ repellent to add to your home cleaners: laundry detergent, soaps, dishwashing liquid, floor cleaner, bathroom and toilet bowl cleaner. The options are endless! Uses: Mix eucalyptus and peppermint with some coconut oil for a DIY Vapor Rub. Store the ingredients in an airtight container and rub your chest with the mixture as needed. You can also diffuse eucalyptus overnight to help clear out colds and flu symptoms from the body or, for more instant relief, you can make a eucalyptus steam bath. Pour 1 cup of boiling water into a bowl and then drop 3-5 drops of eucalyptus. Hover your face over the bowl so you feel the steam, cover your head with a towel, and breath deeply for 5-10 minutes. Grapefruit is an amazing oil to include into your daily routine to boost your mood, help with weight loss, fight inflammation, lessen hangovers, and relieve stress. How can one oil do all of that? Like eucalyptus, grapefruit has antimicrobial and anti-fungal properties. It has been shown to lessen the yeast in our guts that can cause candida and helps to reduces cravings. It eliminate bloat, excess water, and stimulates your liver and gallbladder to get rid of toxins after a night of too many drinks. *Anytime you intend to ingest an oil make sure you are purchasing 100% pure therapeutic oil that only has one ingredient, the oil. Make sure to buy all your oils from a reputable company to receive oils safe for internal and external use. I hope these tips are helpful as the holiday parties and festivities fast approach! By using them, you'll see your stress diminish even when things get hectik. Add some essential oils to your routine and you'll be ready to conquer anything on your to-do list. Liked this blog and know someone who’d enjoy it as well? Be the great friend that you are and send this their way!